Janet Rose Crawford, age 79, of Tiffin, died at 3:20 p.m. Thursday, January 24, 2019, at Elmwood at the Shawhan. She was born August, 18, 1939, in Tiffin, to Donald Edward and Catherine Mary (Borer) Carp. She married Richard Thomas Crawford, September 28, 1974, in St. Andrew’s Catholic Church, Liberty Twp. He died February 24, 2000. Survivors include two daughters, Catherine Crawford (Kay Harper) of Uniontown, Ohio and Annette Rose Crawford (Annette Harper) of Tiffin; companion, Steve Dunn of Tiffin, two brothers, Joseph (Theresa) Carp of New Riegel and Arthur Carp of Marion; a sister, Theresa (Richard) Huffman of Tiffin, a brother-in-law, Firmin Williams of Fostoria; and a sister-in-law, Dorothy Carp of Fostoria. She was preceded in death by her parents, husband, and two brothers, Edward and Robert Carp and two sisters, Barbara St. Marie and Mary Williams; a sister-in-law, Margaret Carp; and a brother-in-law, Clarence St. Marie. Janet was a graduate of St. Francis High School. 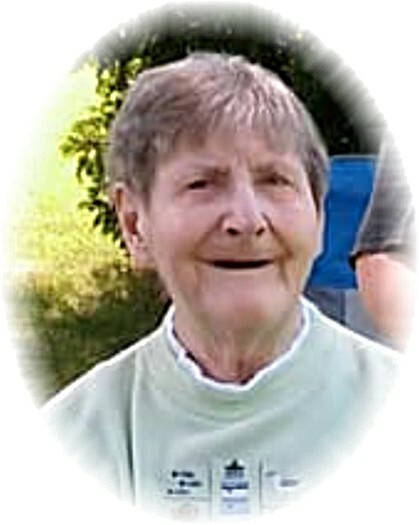 She was homemaker, a former Sister at St. Francis Convent, aka Sr. Mary Donald Carp, and a member of St. Mary Catholic Church, and a former member of St. Andrew Catholic Church, Liberty Twp. She enjoyed playing Bingo and cards. Visitation for family and friends will be 4-8 p.m. Sunday, January 27, 2019, at Traunero Funeral Home and Crematory, 214 S. Monroe St. Tiffin, Ohio 44883 (419) 447-3113. Prayers will be said at 9:30 a.m. Monday, January 28, 2019, at the funeral home followed by the funeral Mass at 10 a.m. at St. Mary Catholic Church. Rev. Anthony Coci will officiate. Burial will follow in St. Mary Catholic Cemetery. The Rosary will be recited 20 minutes prior to the service at the church. Memorial Contributions may be made to St. Mary Catholic Church or to the Sisters of St. Francis.